Got to the beach at about 4:45. Twisted two of the lines while rigging "across the kite'. Another kiter said its better to rig with the lines directly out in front - which avoids confusion and crossed lines. I used my bouyancy vest for the first time - it felt quite good and did not impede my movement. I got up and running to the left (my 'strong side') and was able to really get moving with good control. The key is to back the power off by pushing out the bar if you are getting overpowered. I could focus both on flying the kite - which I was able to keep fairly low - and on steering the board with my rear (right ) foot. The board was carving fairly well and I was alble to really zip along, which was a great experience. Coming back (to the right) was OK too. I was able to get up and planing, but not as consistently. But then it clicked and I was able to make some good ground. On my second run I got yanked off my board on startup but was able to kite drag back towards it, swim to it and grab it, then relaunch my kite without too much trouble. I did a couple of shorter runs out and back, then walked some distance back along the beach. Then the moment - I did a longish run out and a then came back to where I started! A great feeling. Things are really coming together. The key seems to be flying the kite in the right spot, keeping the speed up, and steering the board. I was able to briefly "lock the kite in" on a few occasions for the first time. Then I did a huge run out - thinking it was time to consolidate my learnings. Cut through some biggish waves, then I headed back in. I was so far out I was not able to easily spot which rock groyne I had started near. As I came back in I was able to sneak past the last groyne with good control and get back very close to the start point. I then did a couple of more out and backs. Well, this really confirmed kiteboarding as a superlative experience for me. So much power, so much freedom, so much speed. It is much nicer at this beach. 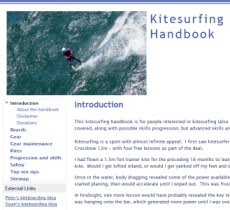 Just a few kiters - some self launching and self landing. I self landed and had a little trouble getting the kite to flip leading edge down but perservered and succeeded.